Our estate is open-air hotel *** is in the heart of “Parc régional du Luberon” in the Vaucluse. The campsite is ideally located to visit the beautiful region and the villages surroundings. Located at Gordes, one of the hundred most beautiful villages of the France, at 5 minutes from the village center, le estate offer you an exceptional view on Luberon, in a quiet and relaxing atmosphere. 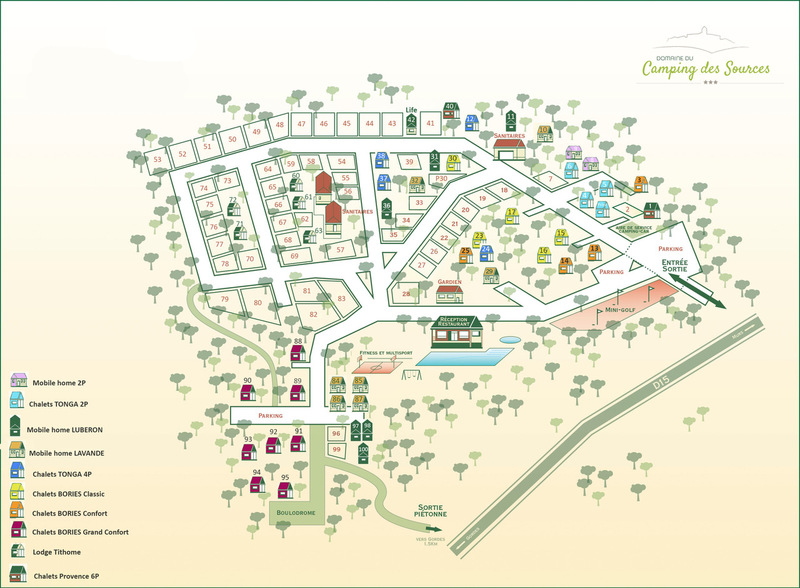 The campsite has 100 pitches in a natural and Provençal setting, rewarded with the Label “Clef verte”. Staying in our certified establishment” Green key “ and “Calm and Tranquility “ is the guarantee of quality services and equipment and the assurance of a preserved environment. Discover al the campsite services and our advantages. If you read attentively, you couldn’t hesitate for your fiutures holidays. Between calm, lanscape and sun come at « camping des Sources » in the Luberon and discover the Provence’s charm. 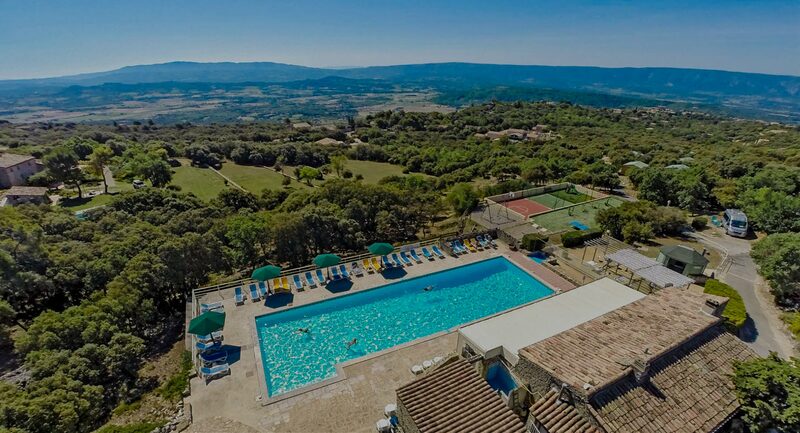 The swimming pool of the Camping des Sources estate offers an exceptional view of the Luberon. Different animations proposed for children and adults. Come and discover the Luberon in Provence and the village of Gordes. In the heart of the Luberon massif, you will find all the comforts of a mobile home and chalet. Our charming campsite in the heart of the Luberon massif in Gordes will offer you comfortable pitches. Discover the services at the Domaine du Camping des Sources. Gordes is located in the Luberon Park, at 340m high altitude around the Monts du Vaucluse, at the south of Mont Ventoux and in the heart of Provence. Our village is known for its beautiful panorama, and its 300 sun days a year ! This beautifully located campsite enjoys panoramic Luberon views. The Camping des sources is ideally located to discover the Provence’s region with the charming villages and the nature typical of the south. The lavander field, the « cigales » and the sun will go well your holidays at Camping des Sources in the Luberon. The Domaine du Camping des Sources is renowned for its calm and serenity. In order to guarantee them for your stay, the latest entertainment ends at 11pm. The playground lighting turns off at 10:30 pm. Rest for our residents is a priority: we therefore ask teenagers to stop noisy gatherings after 11pm. Out of respect for the resident neighbours, everyone is asked to limit noisy discussions after 11:00 pm on the pitches.